In the new window labelled “Open Existing File”, click on the folder where you have saved the sprites downloaded previously, and display its content(e.g., Desktop). Open the folder labelled “pacman” that you have created previously (from the zip file that was downloaded). Select the image labelled “wall”, and click on the button labelled “Open”. This should display a preview of the animated image on the right hand side of the sprite window in Game Maker. At this stage, you should have two additional sprites ready to be used for new objects as illustrated on the next Figure. We will now create a corresponding object. In the section labelled “Sprite”, click on the text “<no sprite> and select “wall_spr” from the list. Click on the button labelled “OK”. In the new tab, click on the empty field below the label “Object to add with the left mouse” and select the object “wall_obj”, that you have created previously..
Once this object has been selected, you can perform a left-click anywhere in the room to add the wall_obj object to the room. Note that to make things a little bit faster, you can keep the SHIFT key pressed after left-clicking, and just drag your mouse around the screen where you want to add new objects. Once this has been done, click OK and test your game to ensure that the collision is accounted for. So far we have managed to account for collisions with walls as Pac-Man moves around the maze. 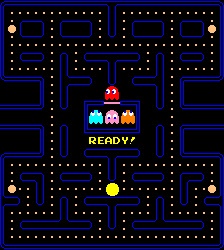 However, in the original game, Pac-Man also need to collect dots (in fact all the dots in the level) to be able to proceed to the next level. Let’s add these dots and implement a pick-up mechanism. In the new tab, click on the empty field below the label “Object to add with the left mouse” and select the object dot_obj, that you have created previously..
Once this object has been selected, you can perform a left-click anywhere in the room to add the dot_obj object to the room. Note that to make things a little bit faster, you can keep the SHIFT key pressed after left-clicking, and just drag your mouse around the screen where you want to add new objects. We can specify what should happen when Pac-Man collides with them. In this particular instance, the dot should disappear (we could also increase the score by 1). Double-click on the Pac-Man object on the left-hand side of the screen. This should display its properties. Click on the tab called “Main1” and drag and drop the icon “Change Sprite” to the action window, as illustrated on the next figure. In the new window, select the option “other” to specify that the other object involved in the collision (i.e., the dot) should be destroyed, as described on the next figure. Congratulations, you can now move to Part3.